Eugene Spearman, radio operator with the 384th Bomb Group, shares a story of life at Grafton Underwood by recollecting some of his own non-combat experiences. Just after we moved into the little Quonset hut as a replacement crew for the 384th BG and 544 BS at Grafton Underwood, an engineer gunner who had flown almost all of his required missions told me about his crew being shot down on a previous mission. He said they had been hit by flak and crash landed in Belgium. His pilot made a wheels-up landing and as the plane skidded for several hundred yards, finally stopped in a large greenhouse or nursery. The large greenhouse with the glass roof was completely destroyed. As elderly lady suddenly appeared, waving her arms and yelling loudly. She said the Germans had gone in a western direction and that her greenhouse had survived. The Germans had gone in a eastern direction and her greenhouse had survived. Then the allies went in a eastern direction and her greenhouse survived. Then an American bird came along and completely destroyed her greenhouse. If an air crewman completed his required missions (35 missions while I was flying), it was standard practice for the other crew members and friends at debriefing to celebrate his good fortune by giving him our individual little glass or shot of cognac. 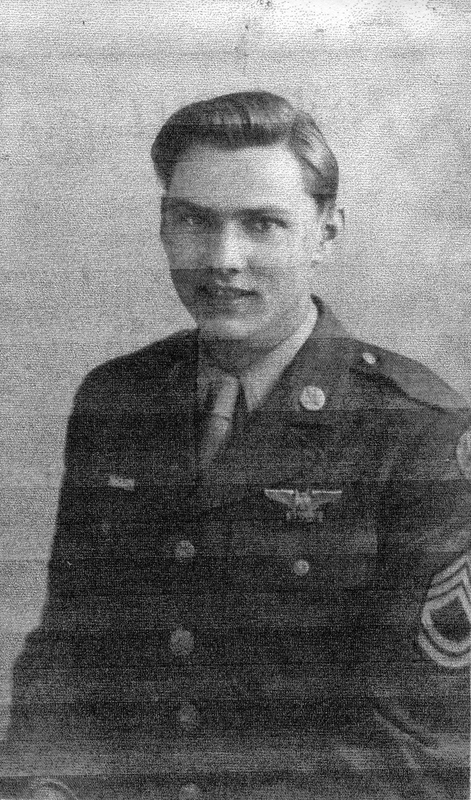 We celebrated with one of my friends, who according to his records had flown the required 35th mission, only to find the next morning that they awoke him and told him that their records showed he had flown only 34 missions. He was asked to fly the mission, but he refused. He was immediately charged with being AWOL and placed in the brig. Later I would see him picking up garbage around the base. I never did know just who made the error in counting the number of missions he had really flown. One city we visited when we could get leave time was Northampton. The large double-decker English buses made a scheduled run from Grafton Underwood to Northampton. The last bus to leave Northampton was at midnight for the base at Grafton Underwood. One weekend, I went on leave to Northampton and for some reason missed the last bus to depart for Grafton Underwood. I knew that if I wasn’t in my bunk and available to fly my mission at the wake-up hour of about 4 a.m., I would be declared AWOL and would be put in the brig. I immediately checked the remaining buses and asked if any were going near the base at Grafton Underwood. One driver informed me he was going within about five miles, so I told him to let me off on the road at that point and I would attempt to walk the remaining distance and try to get there before wake-up time. He finally stopped and told me that was where I should get off the bus. I got off at a dark, dark, cold and damp location and started walking in the direction he had pointed. After I had walked for what seemed like a long time, I suddenly saw a small light coming in my direction. I realized that I was completely lost and decided that I would have to ask whoever was coming in my direction which was the way to Grafton Underwood. It turned out that the small light was on a bicycle. When the bicycle approached, I decided to tackle the rider and ask the rider for instructions on how to get to the base. My football-type tackle of the bicycle was successful, for it turned out the rider was an elderly, small, and scared-almost-to-death Englishman. I was able to hold him in my grasp long enough to tell him that all I wanted to know was which way is it to Grafton Underwood. When I turned him loose, he left in a hurry, and I resumed my walk toward the air base. Fortunately, I made it back to the base in time to fly the next morning. I’m convinced that there was one elderly English bicycle rider on a dark, lonely road that night that wishes he had been somewhere else at that time in history. By thearrowheadclub in 544th Bombardment Squadron (Heavy) on April 27, 2016 . Hi sir my name is Peter hickey, I’m 16 years of age, my great great granduncle would have been traffic sergeant Morgan f hickey, he moved to America from Ireland but last year I found all his old missions, photos and reports in an old biscuit tin which none of my family are aware existed, I also have a painting from a pow who gave it to Morgan in istres, if you ever met Morgan, I’d like to talk!